Director Vasquez wastes no time in approving contracts for political friend and fiancé’s law firm. (Commerce)-Despite repeated claims at Board meetings of promoting transparency, embattled Central Basin Municipal Water District Board Director Leticia Vasquez is using her newfound -and possibly illegal – majority voting bloc status to benefit longtime personal associates including Maurice Chenier, the law office partner of her fiancé Ronald N. Wilson and another close personal associate Jasmyne Cannick. Chenier was hired as a special attorney and Jasmyne Cannick as a media consultant by the CBMWD recently, raising ire from two elected directors of the agency. Hawkins went on to say that, “for no reason they fired our attorney, COO, and assistant manager, now its time to fill those positions with her cronies.” Hawkins represents Cerritos on the five member board and is a former member of the California State Assembly. Chacon contends that Chenier and Cannick have no prior experience working for the District and were hired “without process” by Interim Chief Operating Officer Dave Hill at the sole request of Vasquez. Chenier will be paid a minimum of $300 an hour plus expenses, he lists his office on Flower Street in Los Angeles. An examination of Vasquez’ 2012 California Form 460 disclosure statements lists Ronald N. Wilson as a multiple contributor and his address as 3700 Wilshire Blvd. Suite 655 Los Angeles, CA 90010. Chenier’s website and Linkedin account lists the same address as Wilson’s. 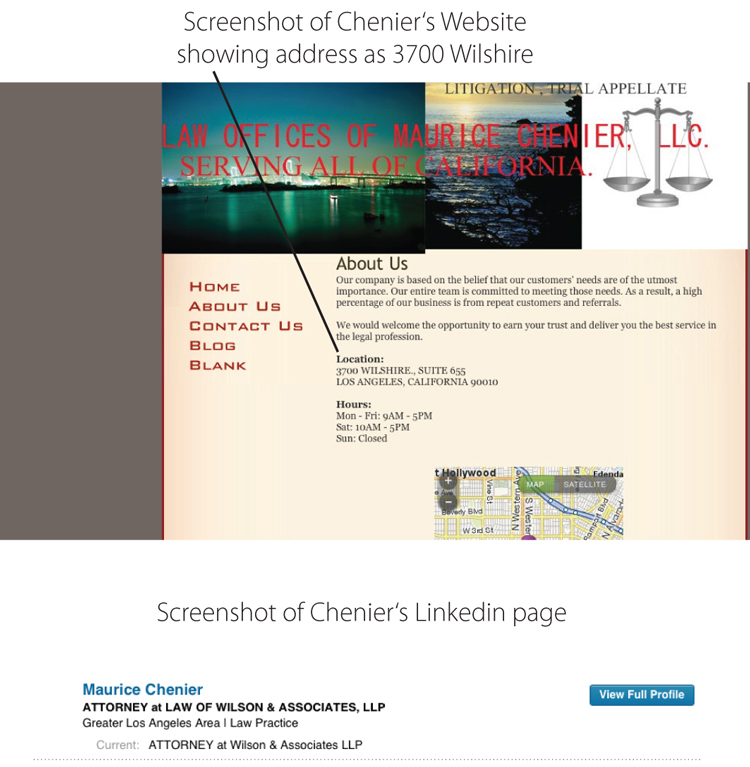 See a screenshot of Chenier’s website and Linkedin account, click here. As evidence of the deal, LCCN found numerous connections between Vasquez, Chenier, and Wilson. 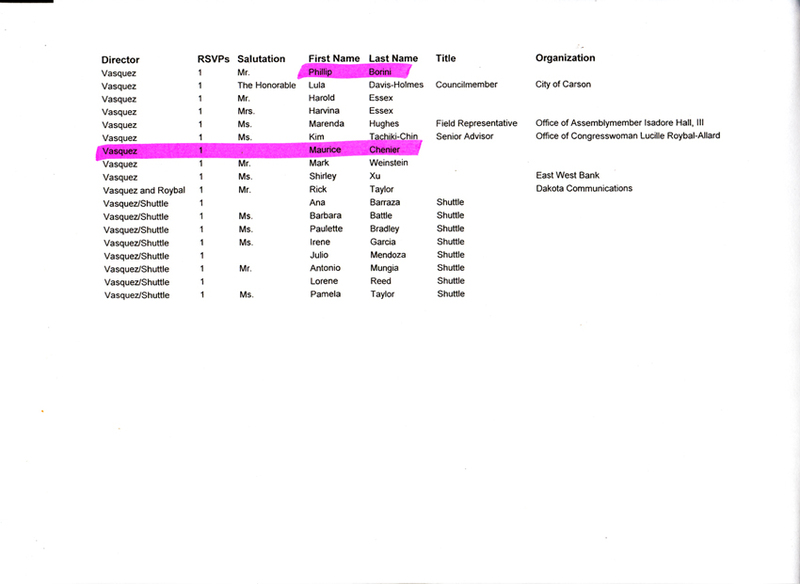 An internal document from Central Basin clearly displays Chenier as having RSVP’d for the District’s January 7, 2012 swearing-in as an invited guest of Director Vasquez, Wilson was also in attendance. An internet search also produced numerous links in which Chenier and Vasquez’ fiancé Wilson are described as “co-counsels.” A lawsuit filed against the City of Lynwood’s Redevelopment Agency show the Law Offices of Ronald N. Wilson & Associates with Ronald N. Wilson and Maurice L. Chenier are described as defendant and respondent for the City. Vasquez served on the City Council in Lynwood at that time and was subsequently recalled along with her colleagues who were later convicted on political corruption charges. Cannick was hired under similar circumstances. At last Monday’s Board meeting, staff offered a presentation of “specialized media relations services” to be provided by Cannick. Vasquez did not disclose her prior relationship with Cannick during the presentation. LCCN also found a Wave Newspaper article dated March 14, 2012 featuring Cannick that refers to her working for various elected officials including Rep. Laura Richardson and former Lynwood Mayor Leticia Vasquez. LCCN’s investigation into Cannick’s hiring has also revealed questionable hiring practices within the District. The District entered into the contract with Cannick on February 1, 2013, but did not obtain signatures until the 15th. In addition almost two months passed before the contract was brought to the Board for review. Interim Chief Operating Officer Dave Hill’s contract was entered into Feb. 1, 2013 and not signed until the 21st. According to Chacon, Chenier and Cannick’s contract were authorized only under the Interim Chief Operating Officer Dave Hill’s spending approval, not the Boards. “Roybal, Apodaca and Vasquez are playing ignorant like they knew nothing about these contracts. They want the public to believe Hill just stumbled upon these Vasquez buddies by chance so it would seem”, stated Chacon. Has anyone followed up to see if there is still a contract with Maurice Chenier or, more billing? Is Littel Albert under investigation by wearing two hat? I thought it was illegal to have two elected positions . Is this Angel Gonzalez, Leticial Vasquez, Isacc Galvan, Rick M., or any other Angel’s puppets…. in a quest for sensationalism have published numerous, demonstrably false statements specifically designed to maliciously injure. It is clear that there has been no effort to propely investigate any of the false statements alleged. Each of you will be sued individually and your viscious false statements will be the demise of your third rate false gossip column. Please provide the name address and telephone number of your agent for service of process in the State of California and the of your lewgal counsel if you have one. This is what I would call excellent reporting. Does anyone doubt that had LCCN not uncovered these bogus contracts, millions more in contracts would be in the works?Everything that I have read in this newspaper paints a clear picture that Bob Apodaca, Jim Roybal and Leticia Vasquez are corrupt and unfit to hold public office. Does LCCN have any insight into the status of the District Attorney’s investigation? When can we expect a picture of these three in front of a judge pleading not guilty and enjoying their day in court?